6/11/2009Share this story on Facebook! Learn more about IC's partnership with Longview. Unique partnership brings students and seniors together: Last fall, Sabrina Higgins ’09 traveled to Longview, a residential senior community in Ithaca, twice a week to teach Harold Sweet, 95, how to use a computer. When they began he didn’t even know how to turn it on, but after a few weeks he was e-mailing with his family. “He didn’t call the computer a ‘monster’ anymore,” Higgins remembers. Each year, approximately 300 students and 25 faculty members from every school participate in clinical, academic, and volunteer activities with Longview residents. Physical therapy majors work with residents as part of their motor development course, accounting majors help residents with their taxes, and students in communication courses organize events for the residents, just to name a few. “Ithaca College students are really lucky to have such a wonderful facility right up the road to get such great experience,” Higgins says. Students clubs also participate in the partnership. Both the dance club and gymnastics team have performed there. The College’s volunteer organization, Circle K, plays bingo with residents every Monday, and the gerontology club gives residents makeovers as part of their Glam Girls program. 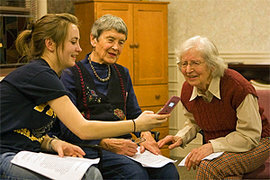 Student singers even perform with residents in the intergenerational choir. Or maybe you can. Besides making appearances in the library, at football games, and at various performances, some Longview residents attend classes on campus. Residents have sat in on history classes to talk about life during the Great Depression and have spoken in aging studies classes about what it’s like growing older. “We like to keep our minds active, while being able to offer stuff to the students,” explains Don Burton, 82. 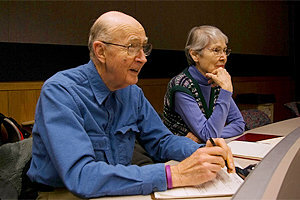 Both Don and his wife, Doris, attend an aging studies class at IC three times per week. Back at Longview, Don participates in the Slice of Life program, in which occupational therapy students and residents teach each other something new. For example, Don teaches the OT students about different plants in the greenhouse while the students teach him how to bake. Doris enjoys the Be Sharp, Stay Sharp program, run by Chris Pogorzala, Ithaca College/Longview coordinator and assistant professor of gerontology. The program engages residents in word, number, memory, and creative activities. “The desire to keep learning and keep social interaction going is all positive for people as they age,” Pogorzala says of these programs. With over 40 programs in place throughout a typical semester, students and residents have many ways to come together and appreciate each other. 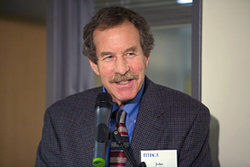 John Krout, professor of gerontology and the director of the Gerontology Institute at IC, says that Ithaca College is one of the few schools that offer students and senior citizens such an interactive experience. Participating at Longview is a great choice for incoming students, adds Higgins. "It's a good way to get involved with the community, make a connection, and get advice and wisdom from someone older than you."